Biography of English Victorian Art Critic. Art Critic John Ruskin (c.1870). One of the greatest art critics of the Victorian era, the English writer John Ruskin had a major impact on art evaluation of the 19th century. His personal views on painting and sculpture (and also architecture), had a huge influence on public taste and, consequently, on the reputations of many Old Masters and the art movements which they represented. A devotee of Venetian painting, the English master JMW Turner (1775-1851), the Pre-Raphaelites, and Gothic architecture, he believed that most Baroque art - such as the work of the Bolognese School and the wild Byronesque landscape paintings of Salvator Rosa (1615-73) - was insincere and therefore bad. He was also a committed social reformer (he gave away all his inheritance) and believed in the dignity of labour and the importance of craftsmanship - views which resonated in particular with William Morris (1834-96) and the English Arts and Crafts movement. His writings on art - most of which were completed before 1855 - included Modern Painters (published in 5 volumes, 1843-60), in which he argues that the artist's main role is "truth to nature"; The Seven Lamps of Architecture (1849); and The Stones of Venice (published in 3 volumes, 1851-3). In all of his books and articles, he stressed the connections between nature, art and society. Despite an unhappy personal life and an old age marred by illness, Ruskin is remembered as one of the great commentators on both the aesthetics and the history of art. 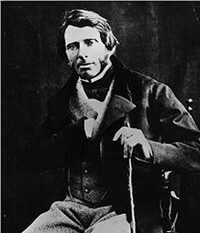 A precocious, highly-strung boy, the son of John James Ruskin, a wealthy wine merchant, he developed a natural talent for drawing and watercolour painting. Encouraged (though also watched over) by his parents, he explored the local Dulwich Picture Gallery and travelled with the family around Europe, viewing many sites of the Grand Tour. In 1836, he began his studies at Christ Church College, Oxford, where he won the Newdigate Prize for poetry and began collecting works by Turner. Much later in life he returned to Oxford as Slade Professor of Fine Art (1869-77 and 1884). An unsuccessful marriage in 1848 to Euphemia Chalmers (Effie) Gray followed, as did his next masterpiece - this time on medieval architecture - entitled The Seven Lamps of Architecture (1849) - the title derives from the seven moral attributes that Ruskin considered inseparable from all architecture: sacrifice, truth, beauty, power, life, memory and obedience. In 1851, the first volume of his third book - The Stones of Venice - appeared, while at the same time he encountered the group of English painters known as the Pre-Raphaelite Brotherhood: William Holman Hunt (1827-1910), Dante Gabriel Rossetti (1828-82), Edward Burne-Jones (1833-98) and John Everett Millais (1829-96) who later married Ruskin's wife. Believing them to have been unfairly treated by the critics, Ruskin wrote several articles in their support. During the 1850s, he wrote three more volumes of Modern Painters (1852-60) - including a rather disjointed fifth volume on the Renaissance in Venice, looking at Venetian Altarpieces (c.1500-1600) and works by Paolo Veronese (1528-88) - as well as regular reviews of the annual Royal Academy exhibitions, under the title Academy Notes (185559, 1875). These reviews proved highly influential, and were capable of making or breaking the reputation of the artists reviewed. Two artists heavily (and unfairly) criticized by Ruskin were the visionary landscape painter John Martin (1789-1854) and the classical subject painter Lawrence Alma-Tadema (1836-1912). Despite these varied activities, from the late 1850s onwards, Ruskin's chief concerns (aside from acting as executor of Turner's will, and cataloging many of his works) were natural history, economics and sociology. The final point of his career in fine art occurred in 1869 when he was elected the first Slade Professor of Art at Oxford, where he became a highly popular lecturer and also established the Ruskin School of Drawing & Fine Art (1871). He also continued his own intermittent career as an artist, exhibiting his watercolour painting at the Fine Art Society (1878) and at the Royal Society of Painters in Watercolour (1879), in London. In 1877, in a public letter, Ruskin launched a scathing criticism of the American Impressionist-style painter James McNeill Whistler (1834-1903), whose painting Nocturne in Black and Gold: The Falling Rocket (1875, Detroit Institute of Arts), he described as "flinging a pot of paint in the public's face". Whistler sued him for libel, winning damages of one farthing, with costs split between the parties. In the event, Ruskin's costs were paid by donations from the public, while Whistler went bankrupt, but neither party emerged from the episode with much credit. Except for his Oxford lectures, a number of essays, articles and a delightful volume of autobiography, entitled Praeterita (1885-9) (Of Past Things), his last thirty years were marked by a declining mind, and ill health. Paradoxically, while his early brilliance had earned him the reputation of a dilettante, his last three decades witnessed the zenith of his reputation as an art critic. By the 1890s, he was seen as virtually infallible. Ruskin expressed a wide range of opinions on painting, sculpture, architecture and the crafts movement. One which stands out, is his strong belief in the connection between nature and art. He believed passionately that the task of an artist was to observe nature and express it - free of any rules of composition - rather than invent it in his studio. He regularly emphasized his opposition to artists who favoured "pictorial convention" at the expense of "truth to nature". Thus he admired the Pre-Raphaelite commitment to 'naturalism', and praised Gothic architectural design - whose revivalist idiom was extremely popular in Victorian architecture - for its reverence for 'natural forms'. But Ruskin went further, arguing that nature and God are one and the same; that truth, beauty and religion are inextricably linked; that "beauty is a gift of God". He believed, for instance, that Venetian art had deteriorated because artists were losing their faith in Christ, and worshipping transient things like sensuality and money. Ruskin's interests covered the arts, the natural sciences, economics and politics. Their very breadth, however, possibly encouraged by a nervous inability to concentrate, caused problems. His writings on art, for instance - while ahead of his time - were both unsystematic and limited in outlook. His stubbornly negative attitude to Baroque painting (1600-1700) was a case in point - the Bolognese School led by Annibale Carracci (1560-1609) his brother Agostino Carracci (1557-1602) and cousin Ludovico Carracci (1555-1619) being a particular pet hate. Indeed, Ruskin's detailed knowledge was largely confined to Italian Renaissance art, 19th century English landscape painting or 18th/19th century English figurative painting. He had little to say about Impressionism, for instance, which burst upon the Paris art world in the mid-1870s. Nevertheless, his ability to communicate the intense pleasure that art gave him, boosted by his inspirational prose and illustration, overcame many of these shortcomings and made him a revered arbiter of good taste. Numerous artists have acknowledged their debt to Ruskin, including architects such as the skyscraper pioneer Louis Sullivan (1856-1924), the highly influential designer Frank Lloyd Wright (1867-1959), the Bauhaus director Walter Gropius (1883-1969) and the modernist Le Corbusier (1887-1965).  For more about 19th century art critics, see: Homepage.